Okra, a warm season vegetable and cousin to hibiscus, grows as an annual in the United States, particularly in the South. Gardeners value the okra plant for its edible seed pods, which appear after the plant blooms in summer. Okra reaches up to 6 feet in height with proper care and requires warm temperatures to thrive. Once called gumbo, okra is a staple ingredient in the Cajun stew known by the same name. The seed pods harvested from the okra plant are used in soups and casseroles and eaten boiled or fried. Plant okra during spring about two to three weeks after all danger of frost has passed in your area. Choose a planting site that receives full sunlight and consists of well-drained, fertile soil. Space okra plants at least 12 inches apart. Water okra plants once every seven to 10 days throughout spring, summer and fall. Apply water directly to the soil to reduce the risk of disease. Never allow standing water to accumulate around okra or the plant may rot. Cultivate the soil surrounding okra plants with a garden tiller to remove competitive grass and weeds. Manually remove pest plants within 2 feet of okra, when possible, to avoid damaging the root system. Harvest okra seed pods about two months after planting and three to four days after flowers emerge. Pick only the pods that are 3 to 4 inches long, as longer okra becomes tough and stringy. Harvest once every two days to avoid depletion. Fertilize okra immediately after the first harvest to prolong the flowering season and increase seed pod yield. Use a balanced 10-10-10 NPK fertilizer to provide adequate nutrition. Apply following the manufacturer's directions. Use okra immediately after harvesting for optimal flavor and texture. 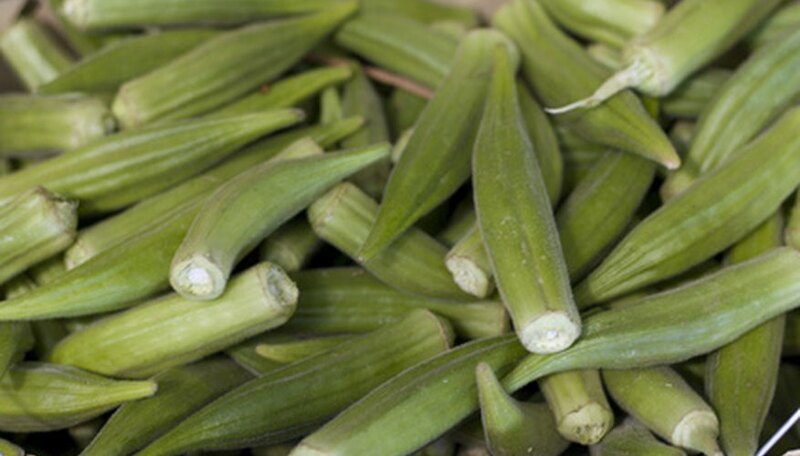 If necessary, store okra seed pods in the refrigerator for three to five days before discarding any unused portion. Propagate okra by allowing some seed pods to remain on the plant until they become large and dry. Pick the pods, remove the seeds and plant the next spring.